Kyung B. Yoon is an award-winning television journalist, documentary producer and expert in the field of communications and media. She is founder and president of KBY Productions, LLC, a full service television and video production company specializing in documentaries and videos with an emphasis on international issues. Kyung also has an active consulting practice conducting media training, mentoring programs, and effective communications skills training to individuals and organizations. Formerly a correspondent for WNYW Fox Channel 5 News, Kyung was the first Korean-American broadcast reporter in New York history. She went on to create and host Global Links Television, an international television documentary series focusing on economic and social development issues. The series, sponsored by the World Bank, is broadcast in more than 60 countries around the world and has won the Best Documentary prize at the Worldfest Houston International Film Festival. Kyung is a former Vice President of the New York chapter of the Asian American Journalists Association. 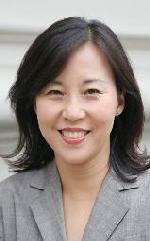 In addition to her professional activities, Kyung is a recognized leader in New York's Asian American community. As immediate past Chair (and current Chair of the Advisory Board) of the New York Asian Women's Center, she worked to raise awareness and support in the Asian American community for the fight against domestic violence, and has been a tireless advocate for women and children's rights to govern their own lives, free from abuse. For her contributions, the New York Asian Women's Center honored Kyung with the 2006 Phoenix Award for Service. Kyung is also a co-founder of the Korean American Community Foundation, a non-profit, community foundation that provides philanthropy and capacity-building assistance to organizations serving the Korean immigrant community of greater New York. As a founding Director and Chair of Fundraising, Kyung has been instrumental in guiding the organization to raise and disburse sustainable, multi-year grants to a diverse group of social service organizations in several program areas including domestic violence, handicapped services and immigrant assistance. In May 2006, Kyung received an award from the City of New York for leadership and distinguished service. In bestowing the award, New York City Comptroller, William C. Thompson, described Kyung as a "role model to generations of young people and who has risen to great heights in her field and given generously of her time to charitable endeavors". Kyung has a BA in English and Political Science from Wellesley College and an MA in International Economics from the Johns Hopkins School of Advanced International Studies. Born in South Korea to a diplomatic family, she grew up in Seoul, Washington, DC and Paris. Kyung is fluent in Korean, French and English, and conversant in Italian and Japanese. She holds a black belt in Tae Kwon Do and has designed and taught a program of self-defense for women. Kyung lives in New York City with her husband, attorney George Wang, and their two children.